It took me years to like and appreciate the Harry Potter films. By my estimation I'll probably like “Fantastic Beasts and Where to Find Them” sometime around the year 2023. There's nothing particularly “wrong” or “bad” about “Fantastic Beasts,” it's just that you either like this sort of thing or you don't. Harry Potter fans will most likely be on cloud 9 while those not prone to flying and magic will likely be bored. Even if the Harry Potter films filled a certain genre niche of fantasy it told a universal story suitable for all ages and audiences. “Fantastic Beasts” is probably as good a film as you could make about a guy who ends up writing a text book. It comes from the mind of J.K. Rowling and director David Yates who must have signed a deal with the devil to direct Wizarding World movies for all eternity. The pair resurrect the magical world of wizards and muggles for another fantasy franchise or at least until the fans grow out of their magical phase. But that ain't happening anytime soon. We finally get a movie set in the wizarding world that isn't about children or teenagers. It immediately gives the film some added weight. Or at least doesn't make you feel stupid for not bring a kid along with you to the theater. 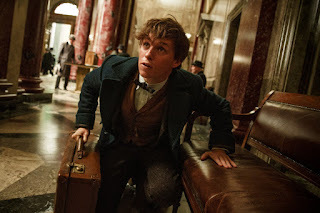 This is the story of Newt Scamander (Eddie Redmayne) author of the textbook “Fantastic Beasts and Where to Find Them” as seen at Hogwarts in the Harry Potter films. Scamander arrives in 1920s New York which means the film isn't filled with wall to wall British accents. We're not quite sure why Scamander is here but he carries a briefcase that seems to be harboring… you guessed it… fantastic beasts. But his bag accidentally gets mixed up with the bag of a local muggle (ie non magical person or what American wizards refer to as a “No-Maj”) named Jacob (Dan Fogler) who just wants to open up a damn bakery but gets caught up in the world of magical wands and creatures and dark entities. You're probably wondering who exactly is the bad guy since Voldemort isn't around yet. That seems to be a more complicated question. Coincidentally, magical forces seem to be destroying parts of the city and Percival Graves (Colin Farrell) is investigating it and also looking for the evil wizard Gellert Grindelwald who has been missing according to the CGI newspapers seen in the film's opening sequence. Then there's the creepy Mary Lou Barebone played by Samantha Morton (and her creepier adopted children one of whom is played by Ezra Miller) who's one of those crazy New York people who gathers people on the street and denounces anything that possible goes against their personal beliefs or religions. Wait a minute is “Fantastic Beasts” actually an allegory for marginalized people in today's society? Feature Trailer for Fantastic Beasts and Where to Find Them on TrailerAddict.